In contrast to the East European platform, the Siberian platform is characterized by a relatively dissected relief, with an average height of 500 m. The modern platform boundaries, shaped during the Mesozoic and Cenozoic, are shown well in the relief and have a rectilinear pattern over great distances (Figure 1.4). Within the boundaries of the platform, the basement is mainly composed of an early Archean metamorphic series, the age of which exceeds 3.0 billion years. The upper Archean and early Proterozoic formations are composed of gently sloping thicknesses within separate basins and grabens, and in their type are similar to the platform cover. The original platform cover is Riphean-Cenozoic. The Siberian platform is characterized by the dissected surface of the basement (within an amplitude of 0-10 km) and is subdivided by a relatively uplifted sub-meridional zone into the deeply downthrown western and eastern parts. The thickness of the crust beneath the platform amounts to an average of 30-35 km, ranging from 25 km within the synclines to 40 km on the shields. The fold zones and deep Jurassic grabens within the cover on the Aldan shield differentiate the Siberian platform from the East European one (Peive, 1980). Within the limits of the Siberian platform, the Aldan shield and Anabar uplift are distinguished. The extremely metamorphosed basement rocks (i.e., various gneisses and crystalline schists), are exposed only within the above structures. All these sequences, the total thickness of which exceeds 15 km, were intensively granitized, in many aspects masking their original nature (Mitrofanov and Taskin, 1994). The Siberian platform basement sediments are exposed on the surface in the regions of the Aldan shield, Anabar massif, and to some extent within the limits of the Olenek and Sharyzhelgsky uplifts (Rozen, 1995). The most important characteristic of the basement is the distinctly expressed block structure within the limits of the shield, massifs, and closed sites, as defined by geophysical methods. The lower Precambrian formations of the Aldan shield are the best investigated. The Aldan complex, including (from bottom to top) the lengrian, Timptonian, and Dzheltulinian series, is underlain by the most ancient melanocratic series of basic and ultrabasic crystal schists, metamorphosed within the granite fades and exposed in the narrow linear zones as trough structures. The lengrian series is represented by quartzites, gneisses, and particularly typical of it, high alumina rocks: sillimanite, cordierite, disthenecorundum, and other gneisses as well as granulites. The high alumina rocks are redeposited and metamorphosed into very ancient weathering crusts. The upper part of this series contains various biotite, amphibole, and pyroxene gneisses and crystal schists, marbles, diopside rocks, and rarely, sillimanite schists. The lengrian series sediments have a thickness of more than 5 km. The Timptonian series is represented by uniform thicknesses of hypersthene gneisses and crystal schists, and to a lesser degree by granulites and amphibolites with a thickness of 6-7 km. The Dzheltulinian series crowns the sequence of the most ancient sediments. Within the narrow synclinoria this series is largely composed of biotite-garnet gneisses, and in the upper parts of marbles, with a thickness of 10 km. Thus, the presence of the ancient Archean (Katarchean) sediments complex with an age of over 3.5-4.0 billion years can be established, as well as the relatively younger lower and upper Archean sediments (2.6-3.5 billion years), overlying the melanocratic, basic-ultrabasic basement. The basement structure, overlapped by the platform cover, is characterized by the presence of blocks with distinct boundaries and various strikes of rocks within the block's interior, which can be only revealed by geophysical methods — usually magnetometry. Over these deeply metamorphosed rocks, terrigenous or sedimentary volcanogenic rocks were gradually deposited with a thickness of up to 15 km, as for instance, the famous copper-bearing Udokan series, representing the original early protoplatform cover. 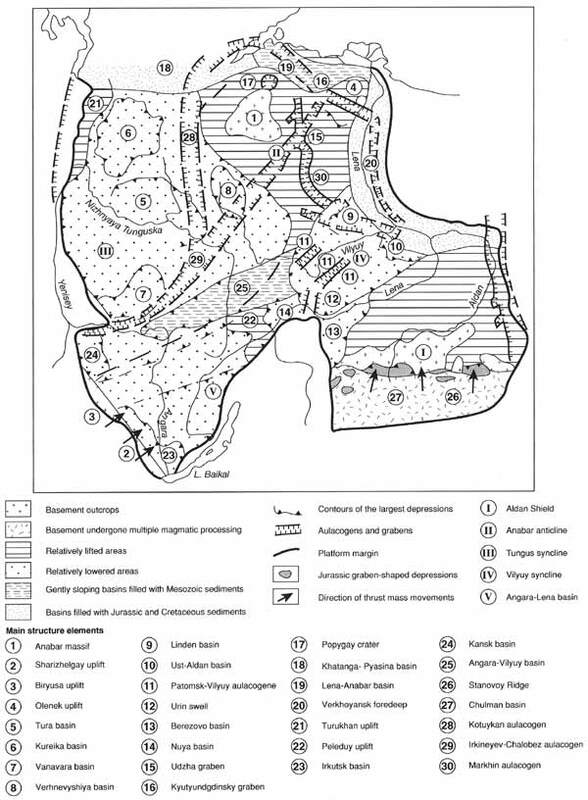 Within the structure of the present platform cover, seven complexes are distinguished: (1) Riphean; (2) Vendian-Cambrian; (3) Ordovician-Silurian; (4) Devonian-lower Carboniferous; (5) middle Carboniferous-middle Triassic; (6) upper Triassic-Cretaceous; and (7) Cenozoic (Figure 1.5). 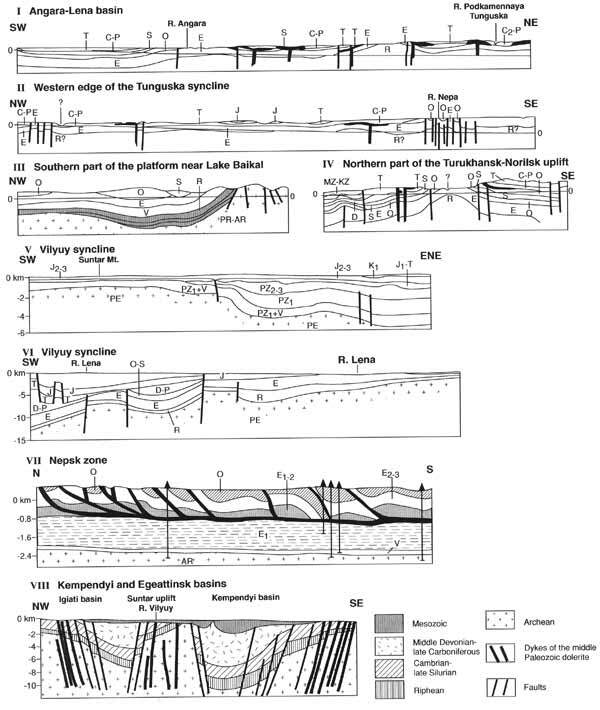 These complexes, according to their stratigraphic volume and type of sediments, differ from the cover complexes of the East European platform, since the Pacific mobile belt influences the Siberian platform. The lower parts of the cover sequence of the Riphean form a number of aulacogenes, the movements within which continued up to the Triassic. The long-term development was observed within the Patomsk-Vilyuy aulacogene from the Riphean to the early Carboniferous. The first four complexes are characterized by the development of terrigenous carbonate and salt-bearing sediments, and the last three by exclusively terrigenous and (in the Triassic) volcanogenic formations (Riding and Zhuravlev, 1995). The volcanogenic sequence of the Triassic occupies almost all the north-western and central part of the Tungus syncline and is distinctly subdivided into two parts: the lower, which is tuffogenous, and the upper, which is mainly lava (Figure 1.6). The lower levels of the volcanogenic sequence are deposited on the upper Permian sediments. They are represented by multicoloured tuffogenous rocks— tuffoargillites, tuffoaleurolites, tuffosandstones, small clastic basaltic tuffs, and ashes. Sometimes, interlayers of oil shale are found. Within higher levels, coarsegrained tuffs and tuffobreccias are developed. The alternation of tuff's, ashes, tuffobreccias, tuffites, and tuffaceous rocks forms a rather complex cross-section, within which a number of intervals can be traced. 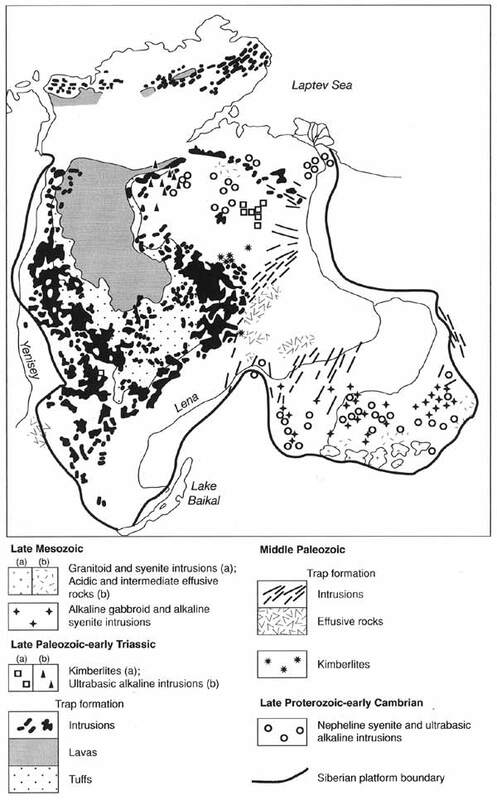 Locally, small exposures of tholeiitic basalts are found. The thickness of the lower series varies from hundreds of metres to up to 2 km. The upper lava series is spread over the central and northern regions of the Tungus syncline and is represented by the exposures of tholeiitic non-differentiated basalts with a thickness of 1-1520 m. These alternate with thin interlayers of tuffs, tuffltes, and sandstones. The basalts are sometimes spread for tens of kilometres, being not very thick. During the formation of the lava series, the maximum thickness of which reaches 2-3 km within the Putorana basin, the basalt outflow occurred from numerous cracks, whereas explosive activity was almost completely absent at this time. Both pyroclastic and effusive products of the volcanogenic series are similar in their content to the typical traps — basalts, dolerites, and andesite-basalts. The age of the volcanogenic series is essentially early Triassic, although, locally, it extends to the middle Triassic and goes down to the end of the late Permian, as was established both by flora and by absolute age dating. On the western slope of the Anabar massif, in the Maimecha-Kotuy region, the outflows of trachybasalts and ultrabasic alkaline rocks occurred, accompanied by intrusions of a similar type. Ultrabasic rocks and carbonatites also occur on the Chadobetsk dome in the south-west of the platform. Besides the effusive fades of the trap formation of the Siberian platform, intrusives are also widely spread. They are located in stripes along the Tungus syncline periphery, within the zones of maximal extension associated with systems of deep-seated faults (Staroseltsev, 1993). The most developed are the sills, largely 'saturating' the upper levels of the Paleozoic and Triassic sediments, and as a result of weathering forming typical structural terrace reliefs. The dikes, stocks, laccoliths, and intrusions of the central type are spread in lesser quantities. Dikes accumulating along the same strike form swarms which occupy vast fields (e.g., along the north-eastern side of the Tungus syncline). The sills are some tens of metres thick, but locally, on southern Taymyr in the region of Norilsk (69°N; 88°E), are up to 0.5 km. In their composition the intrusive traps are similar to normal tholeiitic basalt: dolerites and gabbro-dolerites. More acid varieties of the traps are usually found in the large differentiated sills. The traps are excellently expressed within the magnetic anomaly field. Thus, the formation of this sediment complex was completed in the Triassic because of intense magmatic activity, in which three stages are found: (1) essentially explosive — the time of the tuff series accumulation; (2) significantly effusive — the formation of the lava series; and (3) intrusive — formation of sills and dikes. Explosion pipes, dikes, and veins are widely known and they are formed of diamond-bearing kimberlites (eruptive breccias of ultrabasic alkaline composition); they formed in the late Paleozoic-early Mesozoic. The kimberlites are found in certain regions, the main ones of which are located on the Tungus-Vilyuy saddle and on the south-eastern slope of the Anabar massif. A total of over 200 such explosion pipes and dikes are known, the first of which is the diamond-bearing 'Zarnitsa' pipe, which was discovered in 1954 by Popugaeva. The kimberlite pipes are usually grouped into stripes, probably related to fault zones and the sites of joining of different structural elements of the platform. Frequently, explosion pipes are funnel-shaped in cross-section, and in plan the isometric form is approximately 100 square metres. Near the almost vertical 'stem' of these pipes the containing rocks tend to be disturbed. Nowadays, at least three main phases of kimberlite formation are established: Carboniferous, middle to late Triassic, and early Cretaceous. The platform cover forms the extensive Lena-Yenisey Plate, and within it the Tungus, Vilyuy, and Taseevsk synclines, and the Anabar anticline. On the Siberian platform, the Quaternary sediments are widely spread and are represented by various genetic types. Glacial sediments are developed in the north-west. Further south, they give way to periglacial sediments and lacustrine-alluvial sediments, the most well-developed sequences of which are located in basins (e.g., in the Vilyuy syncline) and in the large river valleys. Within the limits of the tablelands, gravitational and eluvial sediments are also widespread. In the north-west of the platform two glaciations are reliably established: middle and upper Pleistocene (Arkhipov et al., 1980). Recently, it has been possible to recognize in each of them either autonomous glaciations, or the major stages of one glaciation: in the first, Samara and Tazovsk, and the second, Zyryanka and Sartan. The maximum Samara sheet glaciation reached the mouth of the Podkamennaya Tunguska, and beyond its boundary moved in a north-east direction to Khatanga Bay. The glacial formations are presented by ground moraines, fluvioglacial sediments, and so on. Generally, they are correlated with terrace complexes, which have developed south of the glacial limit. As a rule, along the valleys of the large rivers about eight terraces are found, correlating with the early, middle, and late Pleistocene, and formed by pebbles, clays, loams, and sands. Loessal loams of different genesis and dune (aeolian) sands, are widely developed in the southern areas of the platform: they were formed within the extensive periglacial area, most probably in the middle Pleistocene (i.e., during the Samara glaciation). More information about Siberian glaciations is given below. Magmatic formations play an important role in the structure of the platform cover. They are found within the sediments of the lower Proterozoic, Riphean-lower Cambrian, middle Paleozoic, late Paleozoic-Triassic, and late Mesozoic. Ultrabasic, alkaline with carbonatites, and kimberlites and alkaline magmatism are recognized. Trap magmatism is widespread. Its extent exceeds 1 million km3 and is related to the Tungus syncline.